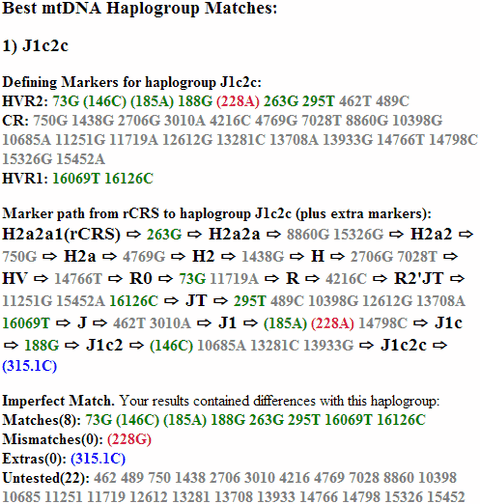 My maternal haplogroup is J1c2b (the last digit b rather than c) on my Irish side. My father, however, is the person who is more likely related to Richard, as he had “stuart” genes, as far as I know. I don’t know his haplogroup. I have only been tested on the maternal side (Irish). My paternal side is Scots and English. I unfortunately don’t really know what more you need to know if I am linked to this family. Could you help? I share both of Joy Ibsen’s mutations at HVR1(+ another 4) and all of her mutations at HVR2 except 146C. Most of my mtDNA J matches to date have had an earliest known mitochondrial ancestor who was either Ulster Presbyterian from Co. Down (as in my case), or Norwegian. Not so odd as it sounds, because Stephen Oppenheimer, in his book “The Origins of the British”, has a map showing migration from present-day Norway to present-day Scotland in the Neolithic, and of course it was mainly Scots who migrated to Ulster during the Plantation period in the early 1600s. My mother is J1c2c and she is from Ukraine, not sure if it helps but I read somewhere that this haplogroup belongs to a Celtic woman who was taken to Scandinavia and then it spread into North and Eastern Europe. Some sources talk about a Polish princess in Richard III maternal line through Catherine Valois. I have noticed your site and would like to add my comments. I don’t know if this will shed any light on things. Any other information re the above genetic signature will be appreciated. does this mean I am a direct descendant of Richard 3rd? I had the National Geographic’s DNA test done mine was J1C2M and it said that King Richard III had the same Haplogroup Subclade. I had my DNA tested with 23and Me….I am J1c2c. I assume that this does not automatically make me a descendant of Richard III, but would it be safe to say somewhere down the line I am Plantagenet? I am J12C2 through DNA testing by National Geographic. And I am 93% Scandinavian and 7% Siberian ancestery. I am female. I have been told that my ancestry is from Norway . Hamish Mcdonald contacted my email address a few weeks back (nelson.manor.house@gmail.com ) and kindly supplied DNA information of his family line that most likley has a connection by shared bloodline of certain members of his family who were or are related to certain royals of the past. I have since decided to stop communication with him as he was not willing to answer my questions even though I was willing to provide certain facts backed up by photos of certain rare visible markers from birth are inherited by certain royals past and present and this writer share the same ancestor , in technical terms it is called Complex Family line inheritance. 1:16069T,1612C,16343G,16519C 2 73G,185A,188G,228A,263G,295T,315.1C,462T,489C my and my childrens. I also share the same maternal halogroup as king richard III. What does that mean really?